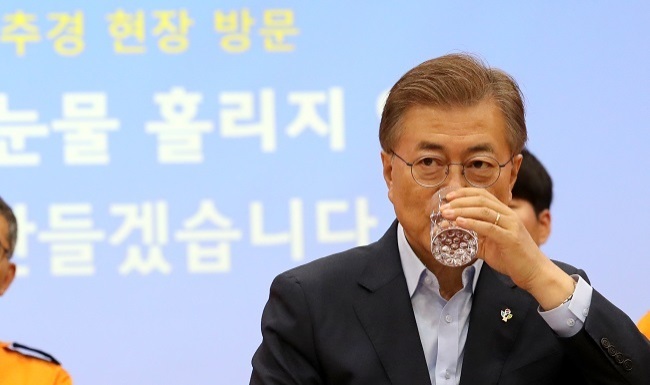 The Moon Jae-in administration’s 11.2 trillion won ($9.97 billion) supplementary budget plan was submitted to the National Assembly on Wednesday, with the main opposition party making clear its rejection of the bill. As the parties readied to clash over the plan, President Moon chose to emphasize the need for the supplementary budget during a visit to a fire station in central Seoul. During the visit, which the presidential office referred to as a “job-creation supplementary budget visit,” Moon spoke to firefighters. He promised to improve their working conditions and increase their numbers across the country, for which the supplementary budget is critical. As part of his job creation plans, Moon pledged to create 810,000 public sector jobs. Of that total, at least 19,000 would be in positions related to the fire department. “I have pledged to increase the number of firefighting personnel by at least 19,000, at least more than that, but I promise again here today,” Moon said. Under the plan, 37 percent of the supplementary budget will be directed toward creating 110,000 jobs, with 86,000 positions in the public sector. Of the total, the central government will spend 7.7 trillion won, and the remainder will be allocated to supporting the local government. The plan includes injecting 4.2 trillion won into hiring civil servants and 1.2 trillion won into improving working conditions. The Liberty Korea Party made its opposition clear soon after the plan passed the Cabinet on Friday, citing the National Finance Act. “The government should revitalize the private sector to enable job creation. In such circumstances, a small government is needed,” Lee Jong-bae said, adding that increasing the number of civil servants would bring more regulations and have a negative impact on the private sector. The National Finance Act states that a supplementary budget is allowed under three conditions: war or large-scale disaster; economic recession, mass unemployment, a change in inter-Korean relations or economic cooperation; and other significant domestic and international changes, under conditions that significantly increase the state’s expenditures. The Democratic Party hit back, saying the country is facing an unemployment crisis and that three supplementary budgets were passed during the previous Park Geun-hye administration. During that administration, the three approved supplementary budgets came to about 39.9 trillion won. “The supplementary budget is aimed at creating jobs in order to stabilize the people’s livelihoods, reduce economic polarization and (achieve) economic growth,” Democratic Party Floor Leader Rep. Woo Won-shik said. Citing unemployment rates that have risen to record levels, Woo said the country was facing a “youth employment crisis” and called for opposition parties’ cooperation. In April, the youth unemployment rate came to 11.2 percent, while the overall figure was at 4.2 percent, the highest in 17 years.